Skimrende kalk, catalogue text for Rikke Ravn Sørensen’s public work Det største i det mindste, det mindste i det største, Ballerup Psykiatriske Center, 2018. Installationview at “The Spring Exhibition” at Den Frie – Centre for Contemporary Art. From left: “Blinded”, DVD 2:30 min., on table with 3 pencildrawings, “Unfinished # 8, 9, 10”, 2015. “Unfinished # 11, 10, 12”, pencil on paper,29 x 42 cm, 2015. Hun gik gennem parken mod museet. Da hun var fremme satte hun sig ned på en bænk. Foran sig opdagede hun projektørerne, som oplyste museet om natten. Hun forestillede sig, at man blev blændet, når de blev tændt og besluttede sig for at vente på, at det skete. Til sidst var det helt mørkt og hun forstod, at lysene ikke ville blive tændt. Det fik mørket til at føles anderledes, mindre kompakt og med flere konturer. Så vendte hun sig om og opdagede, at museet faktisk var oplyst, bare af andre projektører. Hun rejste sig og gik uden at være skuffet. Faktisk følte hun en tilfredsstillelse over, at det ikke blev, som hun havde forventet. Hun havde ønsket at et øjebliks blindhed kunne få billeder i hendes hukommelse til at forsvinde. Men i stedet opdagede hun, at mørket absorberede dem lige så godt. She walked through the park towards the museum. When she got there she sat down on a bench. In front of her she discovered the projectors that lit up the museum at night. She imagined that you would be blinded when they were turned on and decided to wait for it to happen. Finally it was completely dark and she realized that the lights would not be turned on. It made the darkness feel different, less compact and with more contours. Then she turned around and realized that the museum actually was lit up, but only by other projectors. She raised herself from the bench and left without being disappointed. Instead she felt a satisfaction over the fact that it had not turned out as she had expected. She had wished that the flash of blindness could make images in her memory disappear. But instead she came to see that the darkness submerged them just as well. 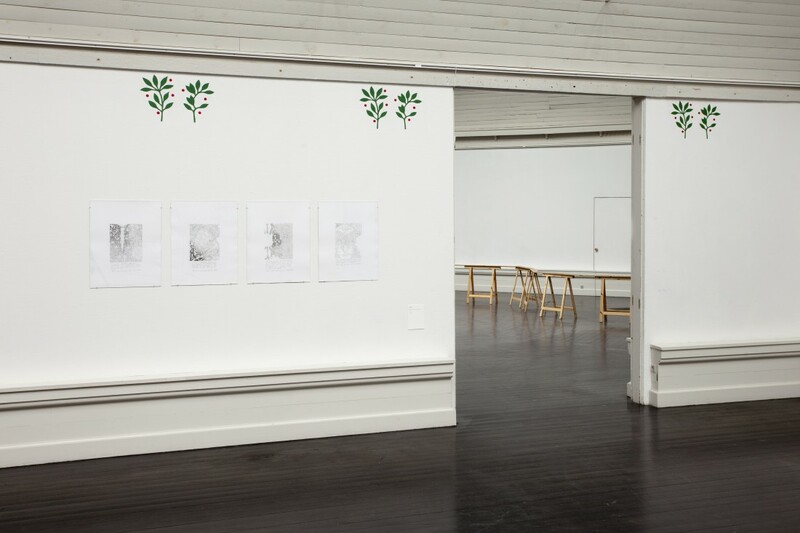 Installation view ”Honeysuckle I – IV (after William Morris)”, 2014, ”100 x Spring”, Den Frie Centre of Contemporary Art. 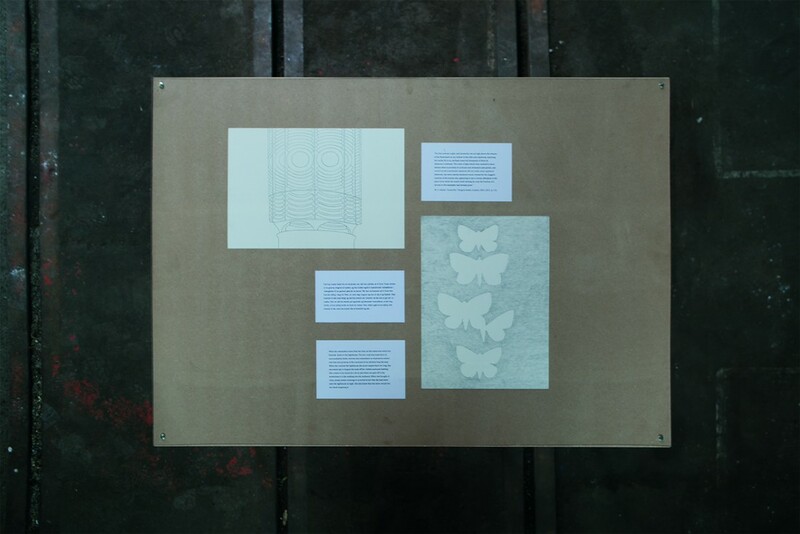 ”Honeysuckle I – IV (after William Morris)”, pencil on paper under glass, 2014. “Honeysuckle (after William Morris) II”, 50 X 65 cm, pencil on paper shown under glass, 2014. “Honeysuckle (after William Morris) III”, 50 X 65 cm, pencil on paper shown under glass, 2014. “Honeysuckle (after William Morris) IV, pencil on paper shown under glass, 50 x 65 cm, 2014. 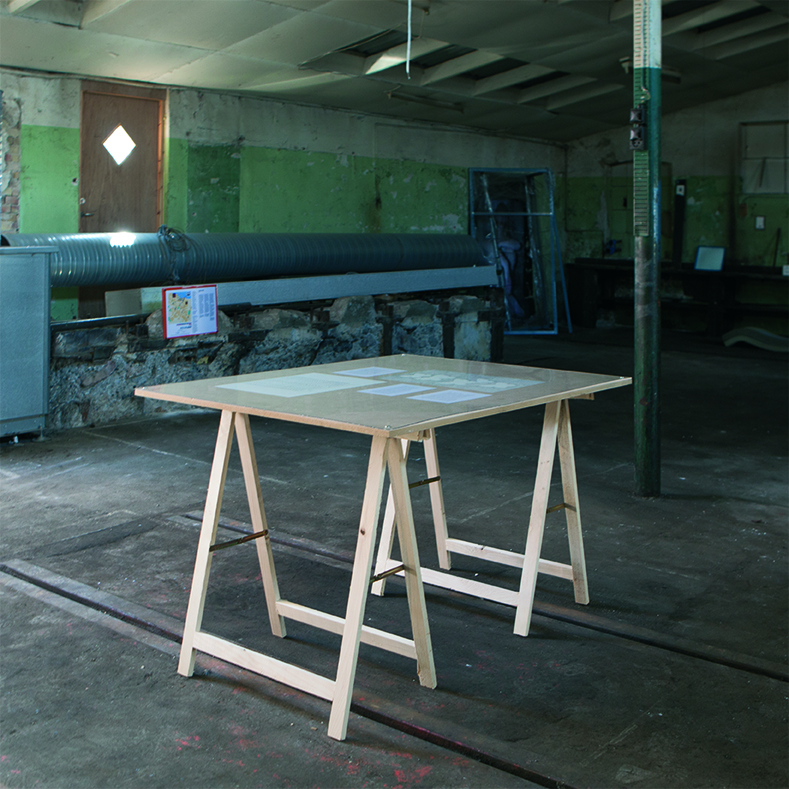 “The Lighthouse”, drawings and texts on table, installationview “Is it a Plane?”, Summer Sculpture Søby, 2014. 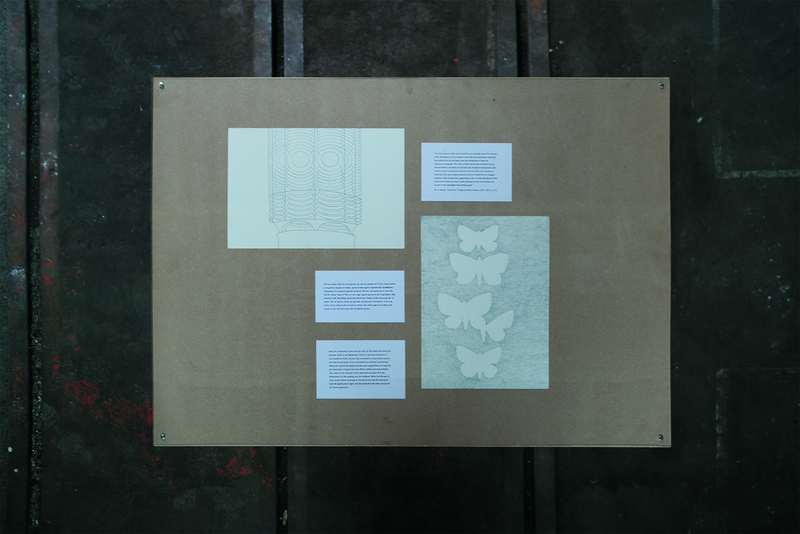 ”The Lighthouse”, drawings and texts on table, 2014. What she remembers most from her time on the island was when she bicycled down to the lighthouse. The dirt road that leads there is surrounded by fields, and she also remembers an impressive walnut tree that was growing in the courtyard of an old farm long the way. When she reached the lighthouse she never stayed there for long. But one warm day in August she took off her clothes and went bathing. One comes to the island by a ferry and when one gets off in the wintertime it is like walking into the darkness. When she thought of rainy, windy winter evenings it occurred to her that she had never seen the lighthouse at night. She also knew that she never would but she liked imagining it. “Summer after Monika, act IV”, walldrawing. 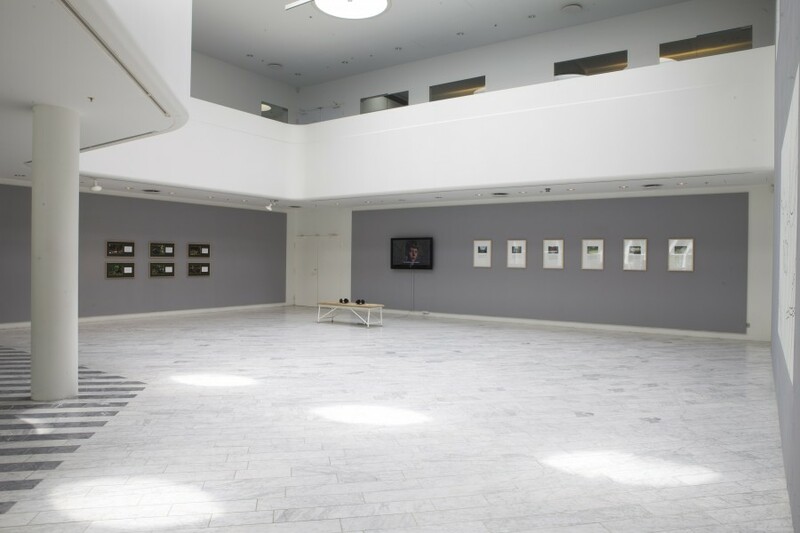 “Refuge” with Anette Abrahamsson, Nässjö konsthall, 2013. From left: “Summer after Monika”, DVD 5:32 min., 2007. 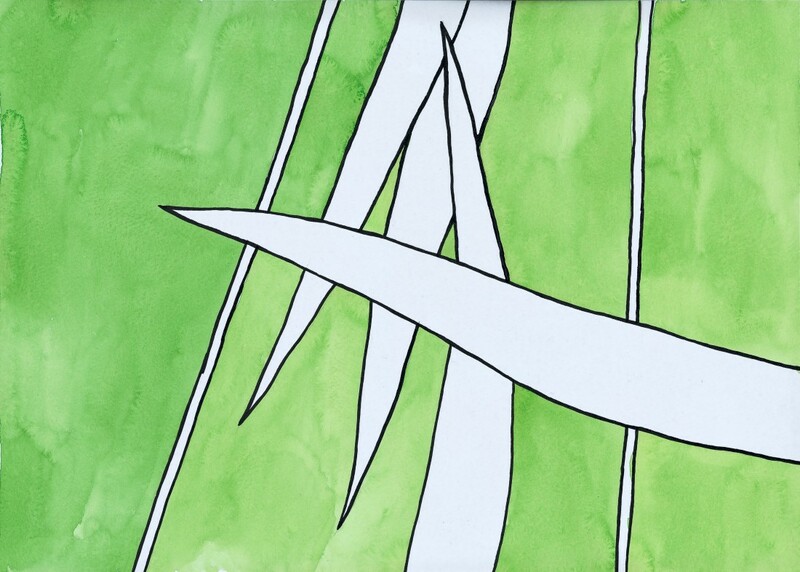 8 sketches for walldrawings, “Summer after Monika, act I – VIII”, watercolour on paper, 28 x 40 cm, 2007 – 2013. “Summer after Monika, act V”, sketch for walldrawing, watercolour on paper, 28 x 40 cm, 2013. “Summer after Monika, act VII”, sketch for walldrawing, watercolour on paper, 28 x 40 cm, 2013. “Summer after Monika, act VI”, sketch for walldrawing, watercolour on paper, 28 x 40 cm, 2013. “Summer after Monika, act VIII”, sketch for wall drawing, watercolour on paper, 28 x 40 cm, 2013. 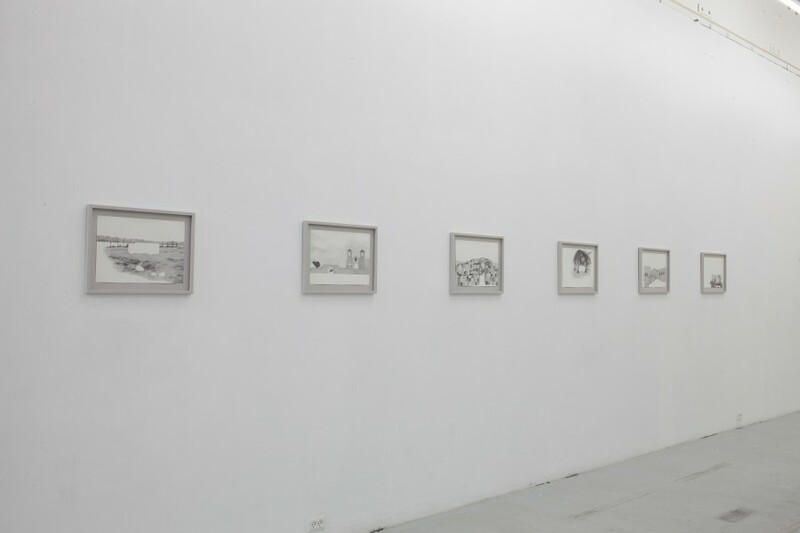 “Defence Mechanisms”, pencil on paper, 29 x 42 cm, installationview “The Spring Exhibition”, Den Frie – Centre for Contemporary Art”, 2013. “Defence Mechanisms”, 10 pencildrawings on paper, 29 x 42 cm, 2013. “Defence Mechanisms: Sublimation”, pencil on paper, 29 x 42 cm, 2013. “Defence Mechanisms: Isolation”, pencil on paper, 29 x 42 cm, 2013. “Defence Mechanisms: Undoing”, pencil on paper, 29 x 42 cm, 2013. Maja Ekelöf: Rapport fra en gulvspand Kritik # 208, 2013. “Artists as Researchers – A New Paradigm for Art Education in Europe”, ed. Mika Hannula, Jan Kaila, Roger Palmer & Kimmo Sarje, Academy of Fine Arts Helsinki, Helsinki, 2013. 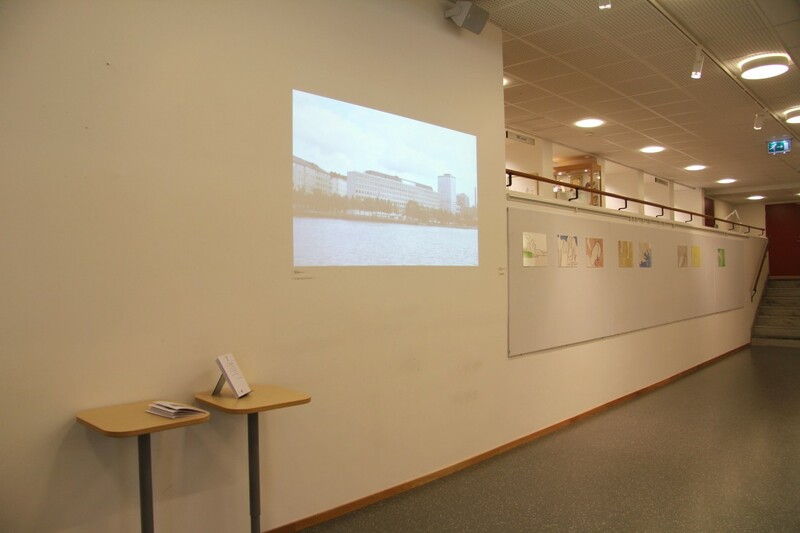 “Hidingplaces”, walldrawing, installationview ”Retake”, Traneudstillingen, Gentofte hovedbibliotek, 2012. “Hidingplace”, walldrawing, “Retake”, Traneudstillingen Gentofte hovedbibliotek, 2012. 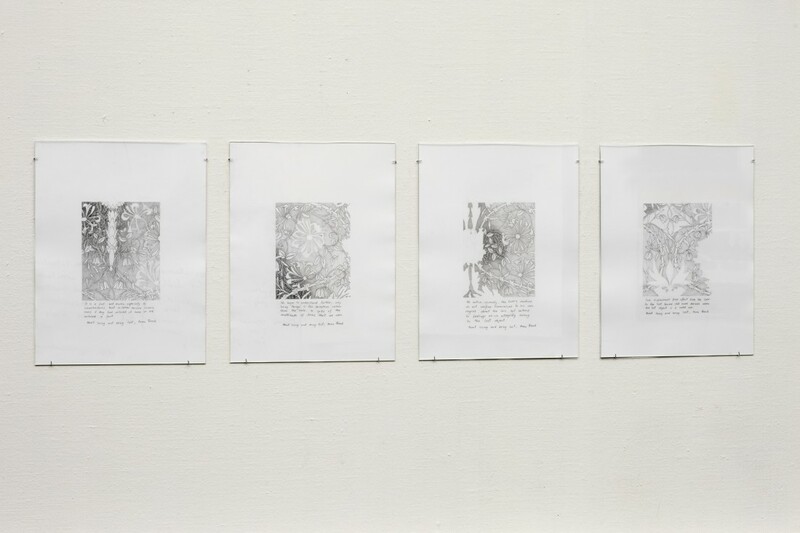 From left: “Hidingplaces”, c-prints with text, 2012, “Behind the Face”, DVD, 2012, “Parkscenario”, c-prints with text, 1999 – 2009. Location for the sound piece “Hidingplaces” in Øregårdsparken. He lowered his head and crawled under the table. After a while his neck started hurting and he was forced to lie on one side. He lay perfectly still and fell asleep. She crawled under the bed. From there she could see feet walking past and then stopping. When the sound of footsteps disappeared from the room, she moved closer to the wall, feeling out of breath. She squeezed herself in between the sofa and the desk. She had to lower her head and pull her feet back so as not to be seem. It felt very uncomfortable and after a while she started to panic. She sneaked behind the kitchen door, closing it so that it would be more difficult to be seen. Time and again she heard someone go past without noticing her. Her pulse beat more rapidly whenever there was someone moving around in the room. He hid himself behind the curtain in the hall. His feet stuck out and he tried making himself as flat as possible so as not to be noticed. He held his breath but in the end he sighed deeply and hoped this would reveal his presence. She opened the cupboard door and crept in amongst the clothes, closing the door behind her. It was reopened several times without her being discovered. As the footsteps disappeared out of the room, she dreaded the thought of having to remain there for very much longer. “Hidingplace I”, c-print 20 x 30 cm, 2012. Han bøjede nakken og krøb ind under bordet. Efter et stykke tid begyndte hans nakke at gøre ondt og han var nødt til at lægge sig på siden. Han lå helt stille og døsede hen. He lowered his head and crawled under the table. After a while his neck started hurting and he was forced to lie on one side. He lay perfectly still and dozed off. “Hidingplaces II”, c-print 20 x 30 cm, 2012. Hun kravlede ind under sengen og kunne derfra se fødder passere som siden standsede op. Når skridtene forsvandt ud af værelset rullede hun forpustet tættere på væggen. “Hidingplaces V”, c-print 20 x 30 cm, 2012. Han gemte sig bagved gardinerne i entréen. Fødderne stak ud og han prøvede på at gøre sig så flad som muligt for ikke at blive opdaget. Han holdt vejret, men gav til sidst slip på luften med et dybt suk som han håbede ikke skulle afsløre ham. He hid himself behind the curtain in the hall. His feet stuck out and he tried making himself as flat as possible so as not to be noticed. He held his breath but in the end he sighed deeply and hoped this would not reveal his presence. ”Hidden Narratives” with Vesna Pavloviç, BKS Garage, 2012. “Unfinished” # 2 – 7, pencil on paper, 2011 – 2012. “Boxes”, DVD, 5:32 min., 2012. “Unfinished # 3”, pencil on paper, 29 x 42 cm, 2012. “Unfinished # 4”, pencil on paper, 29 x 42 cm, 2012. “Unfinished # 6”, pencil on paper, 29 x 42 cm, 2012. Collaboration with Vesna Pavloviç, 2012. Installationview with “The Go-Between”, DVD, 7:30 min., at “The Exception and the Rule”, SAK, Svendborg, 2012. “11 x The Go-Between”, used paperback copies. “Restless”, installationview Danske Grafikers hus, 2012. From left: “Grey # 6”, “Grey # 1”, “Grey # 3”, “Grey # 2”, “Grey # 4”, “Grey # 5”. “Grey # 1”, pencil on paper, 50 x 65 cm, 2011. “Grey # 2”, pencil on paper, 50 x 65 cm, 2011. “Grey # 3”, pencil on paper, 50 x 65 cm, 2011. “Grey # 4”, pencil on paper, 50 x 65 cm, 2012. “Grey # 6”, 50 x 65 cm, pencil on paper, 2012. Installationview “Allusion” with Anette Abrahamsson at Antechamber – Project for Drawing and other Research, Copenhagen. From left: “T-shirt I + II”, c-print 20 x 30 cm, soundpiece “Allusion session” a mix of the sounds in the space, “Grey # 7”, pencil drawing 50 x 65 cm, 2012. “Grey # 7”, 50 x 65 cm, pencil on paper, 2012. 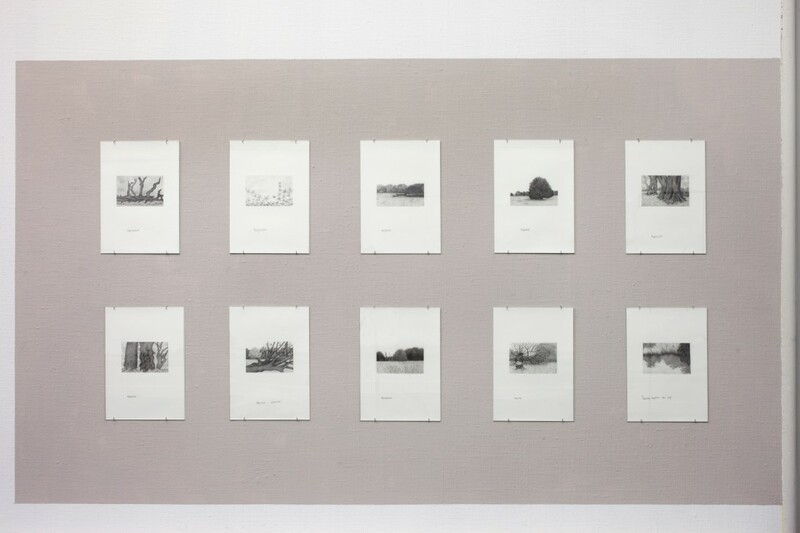 “Dad”, b/w photographs, installed in “Les Paris sont ouvert” at The Freud Museum, London. “Dad”, b/w photograph 19 x 28 cm, 1997. “Dad”, b/w photograph 17 x 25 cm, 1997. A folder with a narrative in text and photos, “Love Me, Love Me Not”, was available in two holders in Østre anlæg, one at Oslo Plads, and the other in Stockholmsgade. 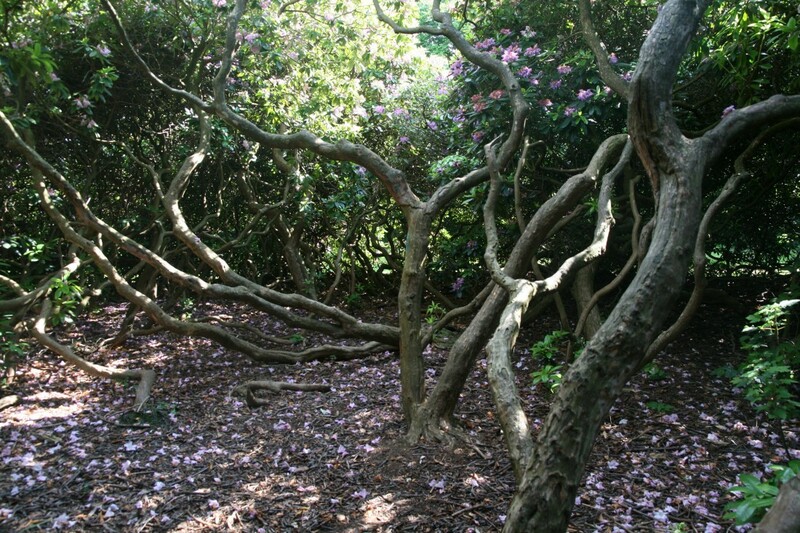 All visitors could take a leaflet where images and texts let a story unfold with the park, in summer and winter, as a background. At the opening of “Love Me, Love Me Not” Pablo Llambias read from his reinterpretation of Suzanne Brøggers essay “Kærlighedens veje & vildveje”. “Las Babas del diablo”, DVD, 5:44 min., 2010, installed in “Paris”, a show with Vesna Pavloviç at Raum 58, Münich. Collaboration with Yvette Brackman, 2011. Installationview “Images Between the Word and the Film”, at Overgaden with “Gaps in the Landscape”. The show was open for two weeks as a supplement to the practice-based Ph.D thesis with the same title. Ph.d thesis “Images Between the Word and the Film”, Faculty of Humanities, University of Copenhagen and The Royal Danish Academy of Fine Arts, 2010. “Gaps in the Landscape”, MDF-panel, 122 x 244 cm, 2010. Installationview “Images Between the Word and the Film” at Overgaden June 2010. From left: “Sometimes the Desert is Red”, 2004 & 2009, “Parkscenario”, “Summer after Monika”, DVD, 5:32 min., 2007, “Las babas del diablo”, DVD, 5:44 min., 2010. “Parkscenario: Parc de la Villette, Parc André Citroën, Parc de Buttes Chaumont, Bois de Boulogne” 24 c-prints 15 x 22 cm,1999 – 2009. “Behind the Face”, DVD, 9:17 min., 2010. När de möttes blev hon omfamnad av henne. Det fick henne till att hoppas på att hon hade förlåtit henne. De gick vidare nära varandra, och skrattade lite för högt varje gång den andra sa något. När de försvunnit bakom buskarna kunde man fortfarande höra dem skratta. She gave her a hug when they met which made her hope that she had been forgiven. Walking along very closely together, they laughed a bit too loudly every time the other one said anything. You could even hear them laughing when they disappeared behind the bushes. Parc de la Villette III, c-print 15 x 22 cm, 1999. Efter att ha suttit en stund på bänken upptäckter hon att en man i närheten iakttar henne. Hon reser sig och går men kan inte låta bli att vända sig om och titta på honom. After sitting on the bench for a while, she noticed that a man nearby was watching her. She gets up and leaves but cannot help turning around to look at him. Parkscenario: Parc de la Villette II, c-print 15 x 22 cm, 1999. En kvinna går under trädet. Hon har en svart kappa på sig som sluter tätt omkring kroppen. Lågt säger hon till sig själv att hon inte skulle ha lämnat honom ensam igen. A woman walks under the tree. She is wearing a tightly fitting black coat. In a low voice she tells herself that she should not have left him alone again. Parkscenario: Parc de Buttes-Chaumont I, c-print 15 x 22 cm, 1999. “The Cinematic Experience”, ed. Alice Autelitano, Campanotto Editore, Paisan di Prato, 2010. Solopresentation with The Apartment, Athens, Greece at Armory Show, New York, 2009. Contributors: Lars Mathisen, Vesna Pavloviç, Pia Rönicke, Elsebeth Jørgensen, Elisabeth Apelmo, Adam Frelin, Caroline May, Anna Ling, Yvette Brackman. Installation view “Technically Sweet, Participant Inc., New York. 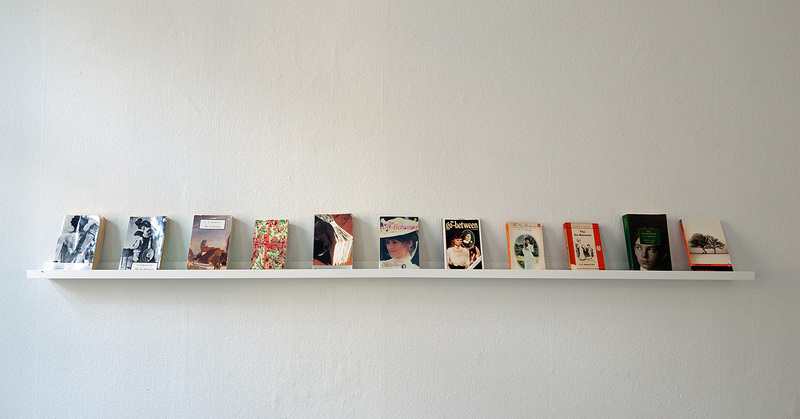 Installation view “Technically Sweet”, Participant Inc., New York. Installationview “Technically Sweet”, Participant Inc., New York, 2008. Catalogue for Technically Sweet, contributing artists: Elisabeth Subrin, Elsebeth Jørgensen, Frans Jacobi, Fredrik Jacobi, John Brattin, Lars Mathisen, Laura Parnes, Maria Finn, Mark Orange, Michel Auder, Michael Stickrod, Pia Rönicke, Ulrik Heltoft, Yvette Brackman. Installationview “Summer after Monica act III”, walldrawing in “In Silent Conversation with Ingmar Bergman” at Kunstmuseum Thun, Thun. 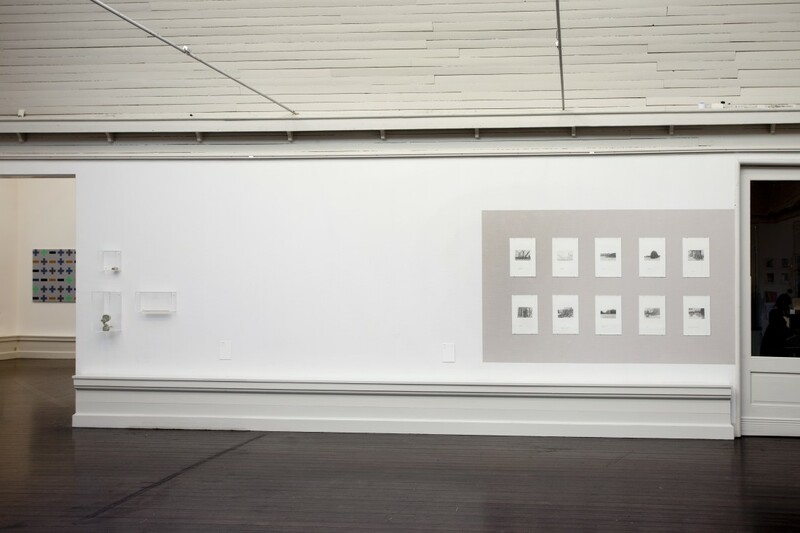 Installationview with “Summer after Monika”, DVD, 5:32 min., 2007, and drawings “Summer after Monika I – VII”, pencil on paper, 29 x 42 cm, in “In Silent Conversation with Ingmar Bergman” at Kunstmuseum Thun, Thun. Installationview with “Summer after Monika”, DVD, 5:32 min., 2007, in “In Silent Conversation with Ingmar Bergman” at Kunstmuseum Thun, Thun. “Summer after Monika I”, pencil on paper, 29 x 42 cm, 2007. “Summer after Monika II”, pencil on paper, 29 x 42 cm, 2007. “Summer after Monika V”, pencil on paper, 29 x 42 cm, 2007. Installationview “Technically Sweet” at Overgaden 2008. “A Technical Problem”, DVD 16 min., 2008 in “Technically Sweet” at Overgaden. “Summer after Monika act I”, walldrawing at The Apartment, Athens. “Summer after Monika act II”, walldrawing at The Apartment, Athens. published in SUM # 1, ed. Malene Vest Hansen, Billedkunstskolernes Forlag, Copenhagen, 2007. “Sometimes the Desert is Red”, installationview at The Apartment, Athens, Greece, 2005. “Sometimes the Desert is Red # 1”, c-print 30 x 45 cm, 2004. “Sometimes the Desert is Red # 13”, c-print 30 x 45 cm, 2004. “Sometimes the Desert is Red # 14”, c-print 30 x 45 cm, 2004. “Sometimes the Desert is Red # 3”, pencil drawing 31 x 44 cm, 2004. “Sometimes the Desert is Red # 5”, pencil drawing 31 x 44 cm, 2004. “Sometimes the Desert is Red # 13”, pencil drawing 31 x 44 cm, 2004. Contributors: Søren Andreasen, Pia Kriegbaum Sørensen, Laura Thors, Jacob Kamp, Mette Vase, Katya Sander. Contributors: Lars Jörgen Svensson, Oliver Hangl, Andrea Creutz, Klaus Thejll Jakobsen, Katinka Ahlbom, Petri Raapana, Christine Melchiors, Cecilie Høgsbro Østergård, Peter Holst Henckel, Magnus Engstedt, Håkan Sandell, Elisabeth Apelmo, Johan Röing, Katya Sander. Contributors: Thomas Björk, Staffan Boije af Gennäs, Andra Creutz, Daniel Rose, Magnus Wallin, Benny R. Jørgensen, Annika Lundgren, Lise Nelleman, Petri Raappana, Annika Ström, Rikke Ruhwald, Simon Sheikh, Lisa Strömbeck, Fredrik Sandblom.